Ski areas in Italy are well-known for their out-of-date ski lifts! This fact is rapidly becoming an ancient myth as many ski resorts are replacing and updating their ski lifts adding this to the long list of reasons to choose Italy for a ski holiday. With regards to snow cover, the ski areas in Italy certainly have nothing to complain about. 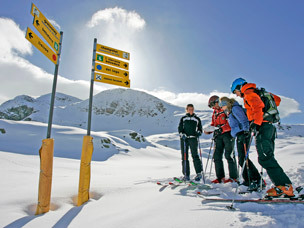 Often when the northern Alps are suffering from lack of snow, the Italian ski resorts are under deep powder! However, if the snow is beginning to thin out, there are always plenty of snow cannons ready to take over. Italian ski areas are suitable for both beginners and experts; beginners can learn to ski with experienced instructors while more experienced skiers can enjoy the seemingly endless slopes.